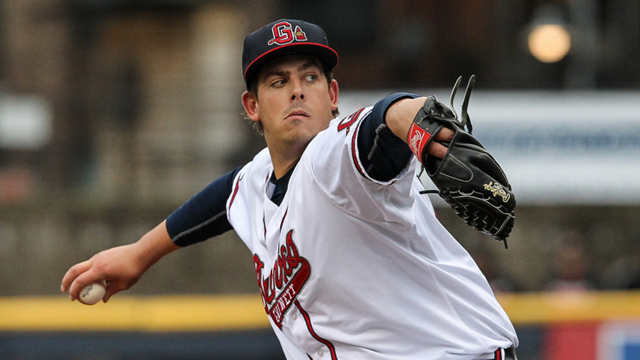 LAWRENCEVILLE, GA - Former Gwinnett Braves' pitcher Aaron Blair has been named the International League's Pitcher of the Week for April 18-24. Blair, now with the Atlanta Braves, went 1-0 with a 0.00 ERA in one start during the week. On April 19 vs. Durham, he pitched 7.0 no-hit innings, walked one and struck out 10 in the G-Braves' 7-2 victory over the Bulls. He carried a perfect game through 5.2 innings and exited with the no-hitter intact after 87 pitches. In three starts with Gwinnett, Blair went 3-0 with a 1.42 ERA (3 ER in 19.0 IP). He ranked among IL pitching leaders in wins (T-1st), strikeouts (4th, 22), WHIP (4th, 0.79), lowest opponent batting average (4th, .156), innings (T-5th) and ERA (8th) as of his promotion to Atlanta on April 24. Blair did not allow a run over his final 14.0 innings at the Triple-A level. The 23-year-old right-hander made his Major League debut with the Braves on April 24 vs. the New York Mets, taking the loss despite allowing just three runs on six hits over 5.1 innings. Blair walked two and struck out one in Atlanta's 3-2 loss. Blair is the first Gwinnett player to win an IL weekly award this season. The Gwinnett Braves (10-8) conclude a three-game series against the Columbus Clippers (9-7) on Monday night at Huntington Park in Columbus, OH. First pitch is set for 6:35 p.m. Right-hander Williams Perez (0-0, 0.00 ERA) makes his first start for the G-Braves, while the Clippers will counter with right-hander Mike Clevinger (1-0, 4.40 ERA). Tony Schiavone has the play-by-play call on 97.7 FM at 6:05 p.m. The G-Braves return home to Coolray Field on Friday, April 29 with a 7:05 p.m. game against the Columbus Clippers. Tickets are on sale now at the Coolray Field Ticket Office, call 678-277-0340 or visit GwinnettBraves.com/tickets to purchase.